Site Administrators are hired by the Construction companies for overseeing, planning, coordinating and budgeting various construction projects. 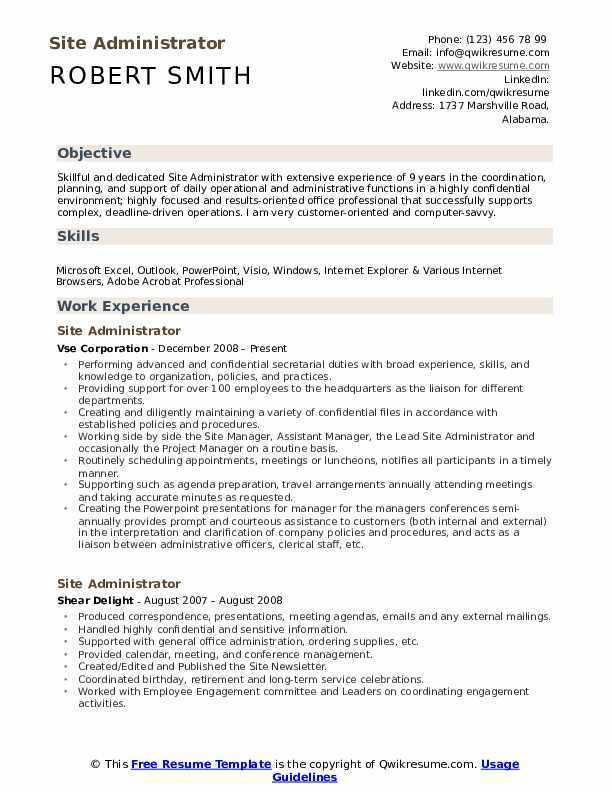 Common tasks highlighted on the Site Administrator Resume include – ensuring construction projects adhere with safety norms, assisting contractors and making sure that the projects run smoothly, conducting on-site inspections, resolving technical issues, dealing with document works, monitoring drawings and maintaining records of installation, coordinating projects from start till finish, complying with safety requirements, and handling all other clerical and logistical tasks associated with related project. 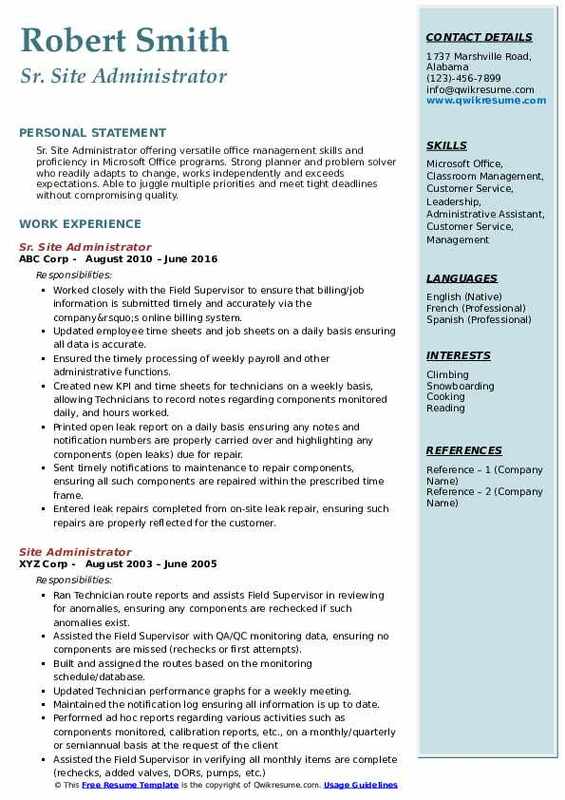 Most of the successful resumes for this role mention skills like – project management expertise, strong interpersonal skills, the potential to monitor and evaluate technical plans, good knowledge of interpreting construction technologies and methods, business aptitude, analytical skills, and time management skills. Typically, employers want from their potential Site Administrators an Engineering Degree in Construction related subject and a few years of experience in relevant field. Summary : Skillful and dedicated Site Administrator with extensive experience of 9 years in the coordination, planning, and support of daily operational and administrative functions in a highly confidential environment; highly focused and results-oriented office professional that successfully supports complex, deadline-driven operations. I am very customer-oriented and computer-savvy. Performing advanced and confidential secretarial duties with broad experience, skills, and knowledge to organization, policies, and practices. Providing support for over 100 employees to the headquarters as the liaison for different departments. Creating and diligently maintaining a variety of confidential files in accordance with established policies and procedures. Working side by side the Site Manager, Assistant Manager, the Lead Site Administrator and occasionally the Project Manager on a routine basis. Routinely scheduling appointments, meetings or luncheons, notifies all participants in a timely manner. Supporting such as agenda preparation, travel arrangements annually attending meetings and taking accurate minutes as requested. Creating the Powerpoint presentations for manager for the managers conferences semi-annually provides prompt and courteous assistance to customers (both internal and external) in the interpretation and clarification of company policies and procedures, and acts as a liaison between administrative officers, clerical staff, etc. Reporting for reimbursement processing, forwarding requests for approvals to the client for payment before travel. Coordinates. Objective : Junior Site Administrator with 3 years of experience in planning and directing executive-level administrative affairs and support. Combined organizational and communication skills with the ability to independently plan and manage diverse business relationships. Strong time management and problem-solving skills with the ability to set priorities and manage multiple tasks. Assisting in the planning, designing, evaluation, and implementation of all aspects of the child care programs in accordance with YMCA of the USA and YMCA of greater Dayton guidelines. Responsible for all aspects of program development, quality and safety. Administering the program in accordance with the Ohio Department of Job and Family Services (ODJFS) guidelines. Cooperating with ODJFS staff for required reports and inspections, responding to inspection requests within required timeframes. Completing annual inspections within required timeframe with the fire department, department of health, etc. as required. Maintaining a clean and sanitary environment and meets all state and local licensing requirements. Inspecting equipment within the building for safety hazards, damage or wear. Communicating any suggestions to direct supervisor to improve the site operations. 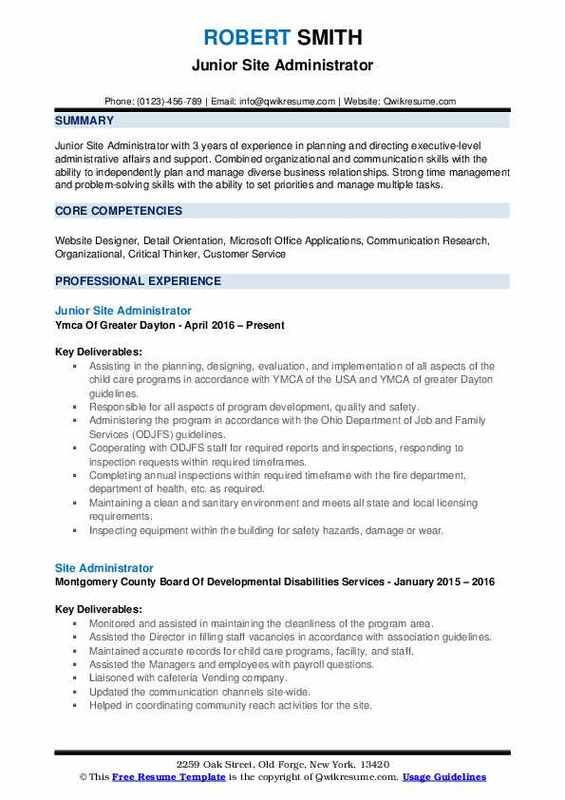 Summary : Senior Site Administrator To obtain a career-oriented position in a professional progressive organization whereby mutual growth and prosperity is underlined, Execution of duties to the best of my abilities and establishing a position of trust, prosperity, and confidence within the company. Self-Profile Excellent communicator. Comfortable with a fellow customer at any level and multicultural environments with a positive hand on Approach, especially in a Productive environment. Maintaining the employee database, maintaining /updating leave records, preparation of salary statement. Arranging conducting interviews/initial screening of the candidates/ helping in recruitment processes. Conducting various welfare activities. Community initiatives programmes organizing participation. Regular updating the communication channels. Preparing and submitting all relevant HR letters/ documents/ certificates as per the requirement of employees in consultation with the management. Preparing process timely distribution of salary, bonus, increment salary slip, leave encashment and full final settlements. Record, maintain and monitor attendance to ensure employee punctuality. Maintaining and regularly updating the master database (personal file, personal database, organogram) of each employee. Objective : Junior Site Administrator with a career objective is to improve and implement sound financial and administrative control systems that will bring about fiscal discipline in government, corporation, NGOs and a financial institution both national and international. Additionally, my objective is to develop the capacity for sound financial management practices, thereby enhancing productivity. Coordinated and assisted the site superintendent and the construction manager to organize daily site activities and/or any site execution related matters as an administrative officer. Organized, maintained and led the CPG site office, project documentation and local site personnel (e. G. Local engineers, clerks, drivers, site assistant, housekeeper, etc). Assisted Site Superintendent/Construction Manager to secure that safe, clean and sufficient accommodation/local transportation (vehicles) are daily maintained for CPG's personnel including visitors (project team, vendors, field engineers, etc). 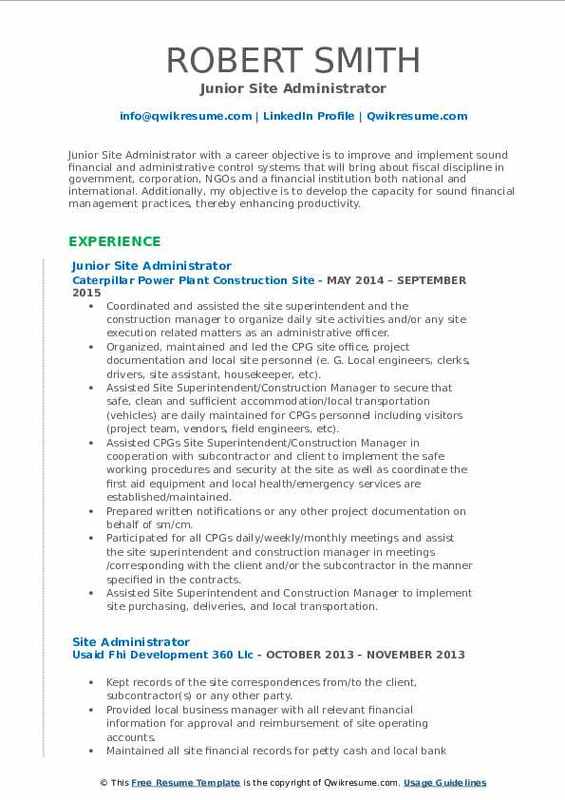 Assisted CPGs Site Superintendent/Construction Manager in cooperation with subcontractor and client to implement the safe working procedures and security at the site as well as coordinate the first aid equipment and local health/emergency services are established/maintained. Prepared written notifications or any other project documentation on behalf of sm/cm. Participated for all CPGs daily/weekly/monthly meetings and assist the site superintendent and construction manager in meetings /corresponding with the client and/or the subcontractor in the manner specified in the contracts. Assisted Site Superintendent and Construction Manager to implement site purchasing, deliveries, and local transportation. Summary : Sr. Site Administrator offering versatile office management skills and proficiency in Microsoft Office programs. Strong planner and problem solver who readily adapts to change, works independently and exceeds expectations. Able to juggle multiple priorities and meet tight deadlines without compromising quality. Worked closely with the Field Supervisor to ensure that billing/job information is submitted timely and accurately via the company’s online billing system. Updated employee time sheets and job sheets on a daily basis ensuring all data is accurate. Ensured the timely processing of weekly payroll and other administrative functions. Created new KPI and time sheets for technicians on a weekly basis, allowing Technicians to record notes regarding components monitored daily, and hours worked. Printed open leak report on a daily basis ensuring any notes and notification numbers are properly carried over and highlighting any components (open leaks) due for repair. Sent timely notifications to maintenance to repair components, ensuring all such components are repaired within the prescribed time frame. Entered leak repairs completed from on-site leak repair, ensuring such repairs are properly reflected for the customer. Updated electronic calibration spreadsheet, ensuring analyzers are properly calibrated according to required specifications. 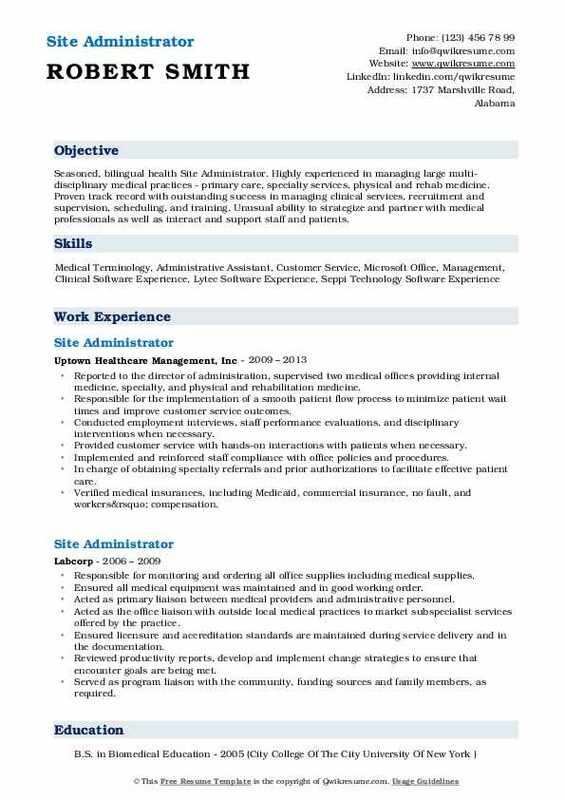 Summary : Seasoned, bilingual health Site Administrator. Highly experienced in managing large multi-disciplinary medical practices - primary care, specialty services, physical and rehab medicine. Proven track record with outstanding success in managing clinical services, recruitment and supervision, scheduling, and training. Unusual ability to strategize and partner with medical professionals as well as interact and support staff and patients. Reported to the director of administration, supervised two medical offices providing internal medicine, specialty, and physical and rehabilitation medicine. Responsible for the implementation of a smooth patient flow process to minimize patient wait times and improve customer service outcomes. Conducted employment interviews, staff performance evaluations, and disciplinary interventions when necessary. Provided customer service with hands-on interactions with patients when necessary. Implemented and reinforced staff compliance with office policies and procedures. In charge of obtaining specialty referrals and prior authorizations to facilitate effective patient care. Verified medical insurances, including Medicaid, commercial insurance, no fault, and workers’ compensation. Monitored billing workflow by ensuring collections of co-payments, reviewed all superbills for accuracy and completion prior to submission to billing department including all supporting documentation. 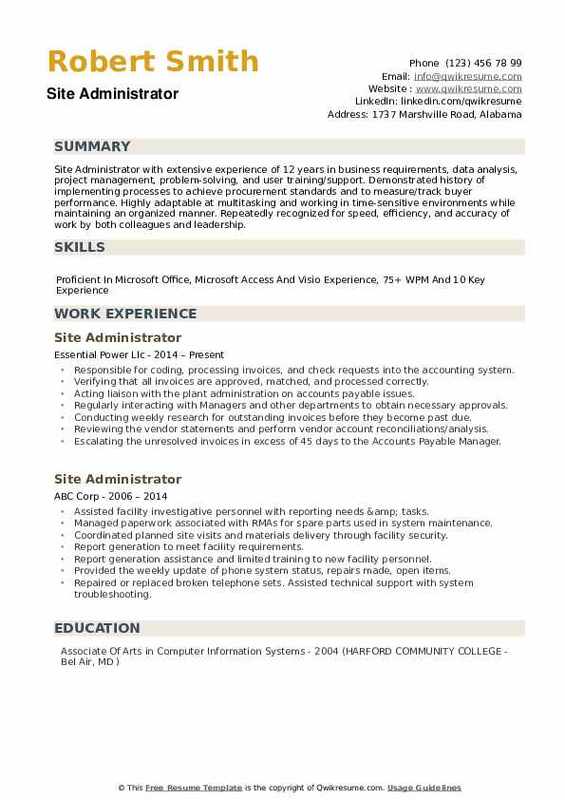 Objective : Dedicated and focused Site Administrator who excels in management through interpersonal skills, multitasking, problem-solving, and following through to achieve goals. Seeking a role in management and leadership, to continue professional growth and personal development. Having good interpersonal and communication skills, with a high degree of maturity and a sense of good judgment. I am creative, flexible and capable of working in a fast moving multi-cultural environment. Supervisor over 6 staff members (nurse, 3 counselors, clerk, 1 observer, nurse practitioner). Developing positive working relationships with security staff and medical staff. Conducting mass training for support staff and security staff on mental health processes. 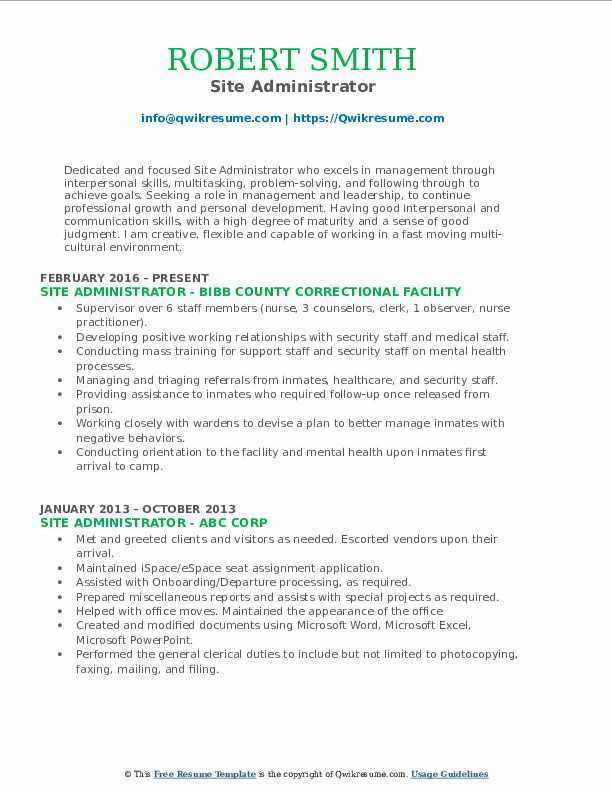 Managing and triaging referrals from inmates, healthcare, and security staff. Providing assistance to inmates who required follow-up once released from prison. Working closely with wardens to devise a plan to better manage inmates with negative behaviors. Conducting orientation to the facility and mental health upon inmates first arrival to camp. Working closely with the medical department regarding medication issues/concerns. Working on an on-call basis 24/7 for crisis intervention (carrying on-call cell phone daily). Providing corrective action plans for corporate audit for regional staff. Providing weekly/daily progress notes for all interactions with inmates. Objective : IT Site Administrator who is determined and self-motivated to produce quality work and perform at high levels. 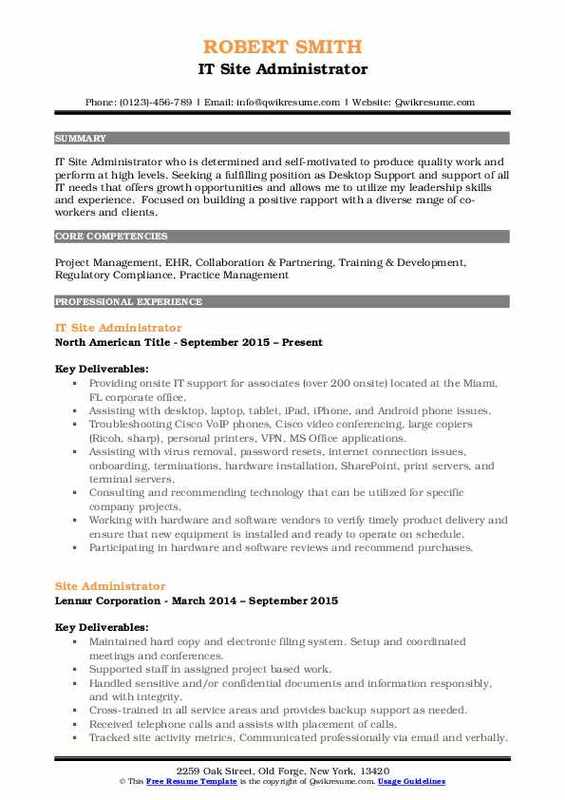 Seeking a fulfilling position as Desktop Support and support of all IT needs that offers growth opportunities and allows me to utilize my leadership skills and experience. Focused on building a positive rapport with a diverse range of co-workers and clients. Providing onsite IT support for associates (over 200 onsite) located at the Miami, FL corporate office. Assisting with desktop, laptop, tablet, iPad, iPhone, and Android phone issues. Troubleshooting Cisco VoIP phones, Cisco video conferencing, large copiers (Ricoh, sharp), personal printers, VPN, MS Office applications. Assisting with virus removal, password resets, internet connection issues, onboarding, terminations, hardware installation, SharePoint, print servers, and terminal servers. Consulting and recommending technology that can be utilized for specific company projects. Working with hardware and software vendors to verify timely product delivery and ensure that new equipment is installed and ready to operate on schedule. Participating in hardware and software reviews and recommend purchases. Monitoring the performance of the company's desktop infrastructure and make suggestions for improving efficiency. Supporting and maintaining the user account information including rights, security, and systems groups. Summary : A dedicated and self-motivated Site Administrator I with substantial success in providing administrative support to management, as well as internal and external clients, and staff. Experience includes HR administration, office administration, and the streamlining of processes and procedures to improve efficiency. Demonstrates excellent organization, pays meticulous attention to detail and prioritizes multiple concurrent duties effectively in deadline-driven environments. Provided administrative support to the Operations Manager, Site Trainer and six Field Supervisors, and continually enhanced procedures. Ensured that deadlines were achieved, and assisted with unscheduled and last minute duties. Administered the weekly payroll process efficiently for over 100 employees, verified attendance, hours worked, and pay adjustments, and distributed weekly payroll reports. 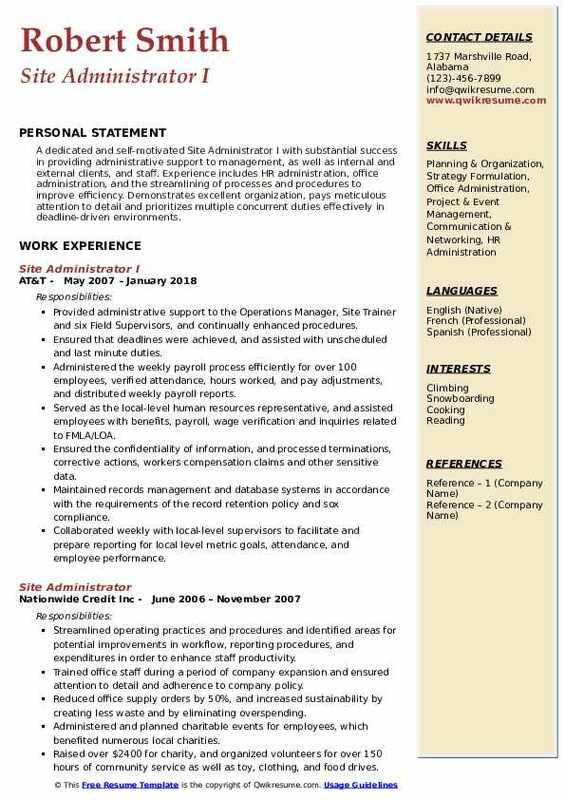 Served as the local-level human resources representative, and assisted employees with benefits, payroll, wage verification and inquiries related to FMLA/LOA. Ensured the confidentiality of information, and processed terminations, corrective actions, workers compensation claims and other sensitive data. Maintained records management and database systems in accordance with the requirements of the record retention policy and sox compliance. Collaborated weekly with local-level supervisors to facilitate and prepare reporting for local level metric goals, attendance, and employee performance. Summary : Site Administrator with extensive experience of 12 years in business requirements, data analysis, project management, problem-solving, and user training/support. Demonstrated history of implementing processes to achieve procurement standards and to measure/track buyer performance. Highly adaptable at multitasking and working in time-sensitive environments while maintaining an organized manner. Repeatedly recognized for speed, efficiency, and accuracy of work by both colleagues and leadership. Responsible for coding, processing invoices, and check requests into the accounting system. Verifying that all invoices are approved, matched, and processed correctly. 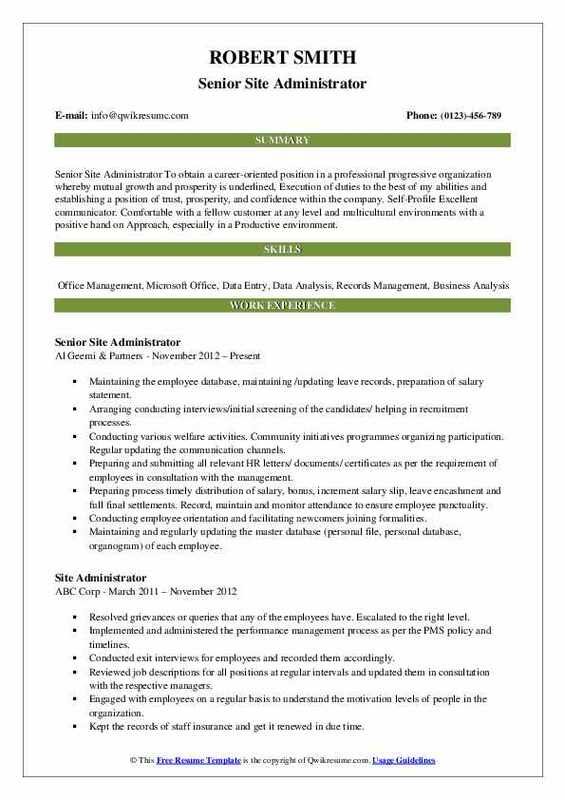 Acting liaison with the plant administration on accounts payable issues. Regularly interacting with Managers and other departments to obtain necessary approvals. Conducting weekly research for outstanding invoices before they become past due. Reviewing the vendor statements and perform vendor account reconciliations/analysis. Escalating the unresolved invoices in excess of 45 days to the Accounts Payable Manager. Responsible for yearend closing activities including accruals and audit requests. Recording entries, analyzing invoices/expense reports and charging expenses to accounts and cost centers. Continually enhancing the job knowledge by participating in various educational opportunities. Generating all required inventory labels, parts/materials packing slips, and approved service tickets utilizing PeopleSoft.